Hero Interview: "Zergs are doing very well"
Thanks to Afreeca's help (facilitation and translation done by Lex Song), TL was able to get interviews with both ASL4 finalists, Flash and hero. 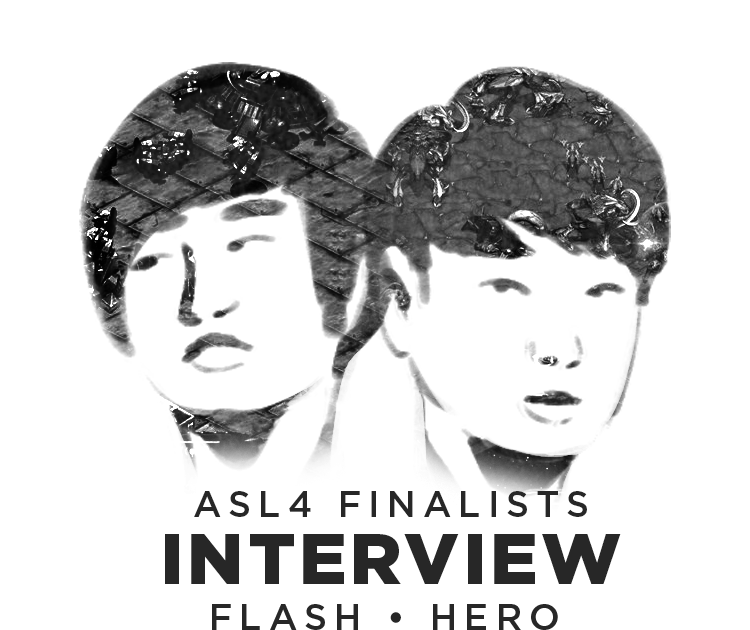 These interviews were conducted after the ASL4 finals concluded and have been edited for clarity. Hero's interview is posted below while Flash's interview can be read here. We hope you guys enjoy them. 1) Hi hero. Thanks for agreeing to this interview with TeamLiquid. For starters, how did you decide on your name, hero and why did you choose to play zerg? hero: Hello, herO here. The herO nickname was the first one I used when I joined the AeGis guild during junior high school, because I felt like I wanted to become a hero in my childhood. At that time, I enjoyed terran and protoss but, zerg was the best. Terran and protoss weren’t as fun for me to play with. When playing as zerg, I used Neo Sauron builds to deal with the protoss. It seemed that I chose zerg because it was lots of fun when I overwhelmed my opponent with a large amount of units. 2) You played great in the finals but unfortunately fell to Flash and took second place. How did you deal with the pressure of having to face Flash in the finals? hero: In fact, there was not much pressure before the game. I practiced hard. I thought I could win if my play went as it did during my practice. I felt high pressure during the game… It seemed that my opponent had a faster timing and units with more energy and force. 3) Your ZvT seems to have come quite far in a short period of time. How did you end up making such huge strides? hero: I don’t think it was a short time. I think that this is the result that I have been practicing for since I first came to AfreecaTV in 2012. But I think there are still a lot of things I that lack. But now, zergs are doing very well. I think it is a huge thing while watching. I watch a lot of games and I always ask other players about things I am curious about. 4) In game 1 of the finals, you went for 3 hatch before pool while Flash opted for a proxy 8 rax. Did you consider the possibility of Flash going proxy rax and still decided to stick with 3 hatch before pool considering the benefits and risks? If not, what did you believe that Flash will open with considering that he seems to have trouble playing on this map? hero: In the first game, I wanted to start rich. I saw a lot of games where Flash won when he played on Crossing Field. Flash doesn’t go for aggressive 8 barrack play, so I thought that he won't be aggressive without any provocation, but I was wrong. My play was based on "Search Double". 5) In game 2 on Gold Rush, you went for 2 hatch hydra and then took a close third base that even caught Flash by surprise. You almost held off Flash's attack as well. What was the reason for the close third if you don't mind sharing? hero: It would have been much better if the hydras had done some damage. If I had expanded to a close location, I would become rich safely but since I couldn’t do any damage, the terran timing was getting faster. I think it’s my style to expand to a close location like protoss, get rich and face my opponent. 6) Game 3 was quite the thriller. You came back from a losing position to take a macro game despite Flash being ahead after denying your fourth and being prepared for the drop. When did you believe that the game was yours? hero: I think it was a hard game. It is a normal practice scenario to take 4 gas before the first drop, but 4 gas was constantly blocked and it was a situation that you could lose due to this. However, even though Flash had great drop defense ready, the first drop went in well and seemed to have found a good gap there. In addition, I thought I could win by using zergling attacks and filling up drones at my expansions. 7) In game 4, after Flash tried to bust your sunkens, you only had 2 drones on the gas at your natural. Aside from Flash's feint and lurker bust at your third, how much did this error affect your game? hero: Lurker tech was spotted so soon. I was under a lot of pressure. So, I made mistakes and I didn’t have enough gas. Due to these reasons, I couldn’t get enough mutalisks out and my timing was so delayed. 3 o'clock fake and frontal pressure made me pull back my mutalisks which made me lose my 11 o'clock. Flash had fantastic movement. 8) How well do you believe you were able to perform in the finals? Will hero undergo another transformation for the next ASL? hero: I have some regrets about the finals. I think Flash was too good with his tight play. I wasn’t able to perform as well as I wanted. I wish to show better performance in the next ASL. 9) Your ZvZ has been looking stellar this ASL and you have made great decisions overall. Have you found a new approach to ZvZ in practice? If yes, please elaborate. If not, how were you able to overcome such strong opponents? hero: Z vs Z timing and control is really important. First, I practiced collecting minerals using drones. What I felt through this practice was that the basics are very important. During the league, the players seemed to have a hard time making predictions when I changed my play style even a little bit. I think practicing together with my colleagues was one of the biggest things that helped. 10) The defensive style of Larva in the Rain vs Larva series is extremely strong and has led to many discussions in the foreign community. Can you please provide some insight into this style that Larva plays and what are the best ways to deal with it as a protoss player? hero: I also felt very surprised when I watched Hong Gyu's play. It seemed that the game was really fun when I saw the aggressive play of Yoon Jong and defensive play of Hong Gyu. Nowadays, there are not many zerg vs protoss games which start with taking the starting expansions and defending (editor note: likely referring to the 2nd & 3rd base). Hong Gyu seems to have his own style. This play is like the play shown in the 3rd/4th place match. While holding the gap in the early middle of the game, take fast 3rd expansion and pressure with mixed units/upgrades. Speed shuttle defense and reavers will be a good combination at the expansions (editor note: bit unclear, might be implying to use reavers both aggressively and defensively). 11) We've been seeing a lot more hydra openings in ZvP in the last year compared to the mutalisk/scourge vs corsair battles that used to be common. Is there a reason for this change in style? Are hydras a much better option to open with? Please elaborate. hero: It seems that protoss these days often play one gate expand. If you do one gate play, zerg will try to match the tech which will lead to defeat. So, they will give up the tech and drone instead which will result in hydra-based games. Going hydras makes it easier for you to lead the game because you can take the initiative. 12) In ZvT, +1 5 rax is a common build that Terrans are going for. What are your thoughts to dealing with this? hero: It's really a tricky build. I get a lot of questions about whether fast lurkers or 7 mutalisks 2 lurkers are good against this build. Personally, I think it would be great to have good defense when using 7 mutalisks 2 lurkers, however, if terran gets a good grip and pressures quickly, there will be many good points for it. Nowadays, there are lots of games where the 3rd hatch is made at an expansion (editor note: likely means another base). When you do this, you should make really good use of zerglings and mutalisks. 13) The transition to mech from +1 5 rax has been on the minds of many in the foreign community due to a lot of zergs having a hard time dealing with it. In your opinion, what's the best approach to dealing with the mech switch? hero: In the past, I have tried hard to take advantage of the mech switch before it was set up. There were a lot of hurried and hasty plays but, nowadays, terran is not in a hurry to expand. For zerg, it is important to use drop and a defiler as they slowly increase the expansion count. It seems to be important to strike the resource line with the drop and to watch the combination of the terran while making mutalisks and the ultras according to the situation and increasing the expansion count. Also, it is important to catch the vessels. 14) The scene has changed greatly from the KeSPA era with streaming being the main source of revenue for many players. What are you current thoughts on how things are progressing nowadays? Where do you see the future of BW at this rate? hero: I’m not sure myself. Flash's military service is very close and it feels very strange. It will be good if there are new rookies coming up from the bottom, but in the present situation, it seems to be too hard for a rookie to come out. We have to make money through broadcasting, but newcomers do not have many viewers and they do not get good returns, so there seems to be no rookies that would devote themselves to BW. As Flash joins the military service, I think one by one, some players will also leave for military service. I hope gamers who have finished military service will put on a good show. 15) One of the major concerns in the scene is about the lack of new blood. Has there been any discussion regarding this among the current players? Maybe some kind of mentorship program that can be put in place to try and help some of the amateur players who show the most potential to be the next big stars in BW? hero: I think so too. I think the current players will welcome any new players when they come out and experience can’t be ignored. It seems there is still a big gap between new and current gamers. I think the mentor program is a really good idea. If we make great efforts to help gamers, new players will appear. 16) Some fans worry that without the support of the fully sponsored pro teams of the KeSPA era, today's aspiring pro Brood War players will never be able to reach the level of the current generation of top players. Do you think these concerns are justified? hero: Well ... I think I might think that way. But now the star version has a different feeling. When I was in the old association, I saw that the teams were divided and there was not much interaction between them. Nowadays, everyone seems to be getting better by sharing solutions. Of course, the amount of practice is not as great as before, but now it's enough to compete and try to win. I think it is almost similar to the highest level. The good thing about living in a professional team is that you will be able to practice enough, but I think that the conceptual part will fall. 17) With the return of a lot more BW players, the skill level has risen greatly and some players have went on record to say that they perform better than during the kespa days. Do you believe that the skill level has increased that much despite the lack of teams, practice partners and coaches? Please elaborate. hero: During the KeSPA days, the concept seemed to be lacking. In my case, I faced protoss mainly on the team, and I could not face much terran and zerg. These days, it seems that it will not be enough to just be good at BW. So, I think that the lack of things will gradually get better through practice. It is also helpful to learn the concept while watching the first person view of a good gamer. It is a lot different from the KeSPA days. 18) In closing, is there anything you would like to say to your foreign fans? hero: I am very grateful to my overseas fans as this is my first greeting to them. Sometimes, foreign viewers come to the show, but due to my lack of English skills, I am unable to communicate well with them. With this interview, I’m very thrilled and happy to know that there are many StarCraft fans. Next time, I wish to have an interview after I win the finals. Thank you so much! Fantastic interview from hero! Let's hope Flash is as engaged as hero next time. Very nice. Excellent work and thank you to hero. Loved hearing his thoughts on this. Thank you Hero for the great interview. Great interview especially interesting views on the last couple of Qs. Thanks for doing these TL! Very nice interview. Hero is a hardworker. I have much respect for him. I love the very detailed Insight on this interview and makes me a bigger fan of hero having heard his thoughts. Don't be too hard on FlaSh, he has given some great interviews in the past. I think circumstances and timing for this one just weren't good timing; for someone reason FlaSh seemed annoyed to be interviewed at that time. Flash said in his interview that he can't stand losing, and herO clearly crushed him here. Maybe he'll practice hard and give at least 2-sentence answers next time >.>. Negativity aside, thanks for doing these interviews!